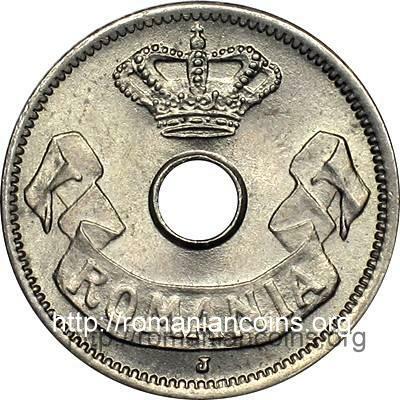 At Brussels were struck 2.000.000 coins in 1905 and 48.000.000 in 1906. 24.000.000 coins were struck at Hamburg, in 1906. 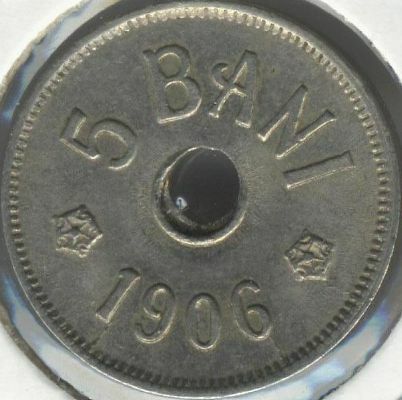 The small value coins struck in 1906 were minted in two mints. We chose to picture the coins featuring a J below the ribbon, because the other set has no distinctive signs. The J marked coins were struck in Hamburg and the ones with no markings in Brussels. 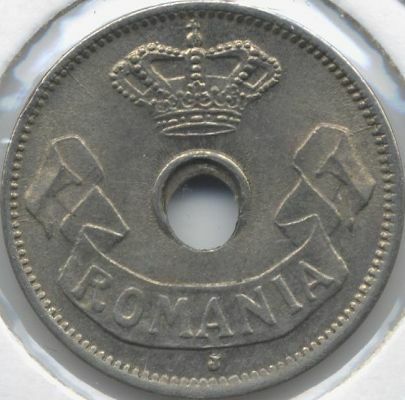 Accordingly to MBR (Romanian Coins and Banknotes, 1977), both sets were designed by Anton Scharff (1845-1903, chief engraver of the Austrian Mint of Vienna). 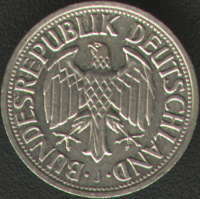 No Hamburg coins were struck in 1905. 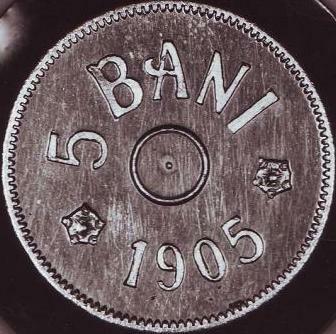 The first European coins with hole in the center were struck in 1901 in Belgium: 5 and 10 centimes cupro-nickel coins, type Michaux. 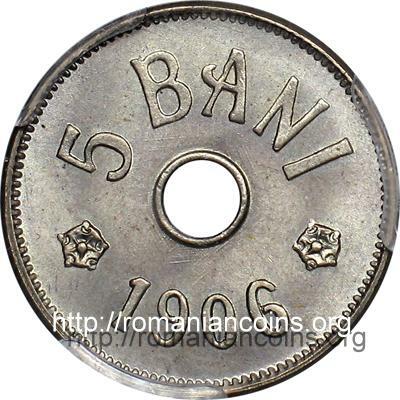 As we can see, the hole fashioned coins arrived quickly in Romania. 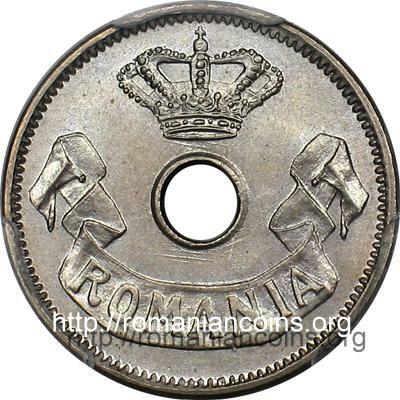 The coins pictures above are present on Romanian coins through the kind permission of an anonymous donor. The pictures above were sent to us by Mr. C. Ciuplea, to which we are grateful. The first coin is a gold essay, without hole. 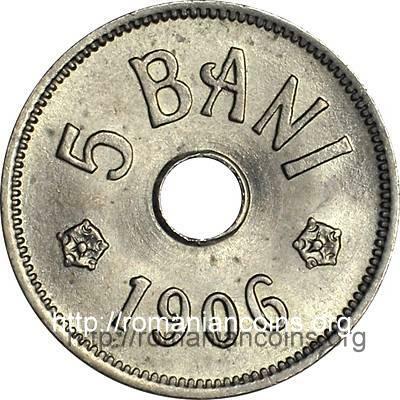 The second picture set represents a 5 bani 1906 J coin, practically uncirculated, struck with a cracked die, so that the coin features 5 outbursting lines, 2 of which are directly visible. A bit eccentric, the hole is oval, the outer rim being emphasized over about 60% of the circumference. 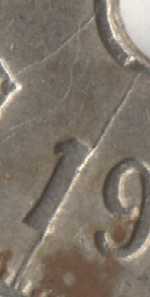 The image above presents a coin struck in 1906 at Hamburg with a broken die. 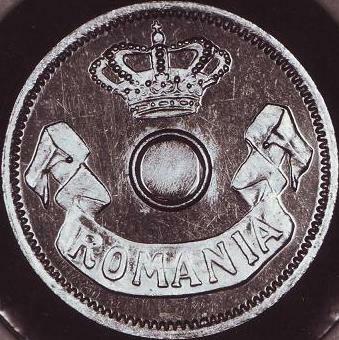 The picture was made available to Romanian coins by Mr Cãtãlin Gavrilã.